<firstimage=”//static.makeuseof.com/wp-content/uploads/2010/12/0-formspring-intro.png”> Formspring is a community of millions of people that all share one thing in common: curiosity. 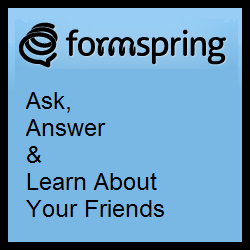 Through conversational Q&A, Formspring helps others express themselves and learn more about their social connections and the people they care about. The idea is simple, anyone can ask you anything and you choose which questions you would like to answer and be made part of your profile. I’ve had Formspring on my radar for quite some time now, wondering if it would catch on, and it has. The curiosity that the site promotes drives engaging, authentic conversations between community members, and over one billion questions have already been answered. As I alluded to in the introduction, Formspring is a kind of social network. Once you claim a profile and add your connections, others can visit your profile and “ask [you] anything”. Questions can pertain to sports, music, movies, comedy, opinions, or really most anything you can think of asking. Whether it’s a universal question like “Who was your favorite teacher?” or a specific question about starting a business, Formspring provides a new, personal way to connect with the people who you want to know better. We originally covered this platform in our directory a while back, but it has gone through a complete redesign since then. How Do I Start Using Formspring? If I’ve made you curious, head on over to Formspring’s homepage and try it out. You can test answering questions to see what it’s like on the site or sign up for an account by clicking on Sign up and find friends. Or, if you prefer not to create a new account from scratch you can just sign in with your Facebook credentials. Once you get set up, you can locate your friends on the other social networks you belong to. Facebook, Twitter, and Myspace are all supported, as well as Gmail and Yahoo. Then start filling out your profile information and brand it to suit your needs. If you have a Twitter account, you’ll find Formspring’s profile settings to be pretty similar. You can fill out a Bio, Location, Website, etc. One setting I find interesting, is the “What do you want to be asked about?” section. By default, this reads “Ask me anything“, which is great if you want to be completely open to any and all inquiries. Making this more specific however, provides a good opportunity to brand yourself as an expert in a particular area as you welcome questions in your field of expertise. What you decide to put here is completely dependent on what your goal of using the website is. All that’s left after designing your profile is to ask and answer questions. Click on the Questions tab to be taken to your page. Anytime somebody asks you a question it will appear here. If you don’t have any questions to answer – which is not uncommon with a new profile – you can send out a link to your profile on your social networks like Twitter and Facebook. Just select which networks you would like the message to go out to and click Send Announcement. Or if you like, you can answer some default questions to get things going. Just click the “Or we have some questions for you!” link and a few questions will appear. As I said, you can answer the ones you want and they will appear on your profile for all to see. You can dismiss questions by clicking Delete and, if you feel the need to, you can click Block to prevent a specific user from asking you questions. Whenever you answer a question, you have the same option to send out your answer to your social networks. This helps draw people onto your profile page for engagement opportunities. You can choose to allow anonymous questions and even go as far as protecting your account and controlling who follows you if you like. Formspring also features integration with blogging platforms like Tumblr, WordPress, and Blogger. And there you have it, Formspring in a nutshell. I find it very interesting how this social network has caught on and continues to reach impressive numbers. The best thing they could have done was integrate the service with Facebook and Twitter, as I’m sure that’s where the majority of users hear about the service. I do suggest you check it out, as it can be an interesting tool to add to your arsenal as we continue to mold our public images online. What do you think of Formspring? Will you be giving it a go, and if not, why? I have a friend who is on Formspring, looking at his profile I can say that the site indeed works pretty well for him. I've had my formspring account for a year; I'm still not sure if I like it or not. I enjoy questions and answers between my core social network, but I'm annoyed by how many idiots ask idiotic questions. Also, it can get spammy. Another thing I find annoying is that anyone can request a password be reset for any account. Because my account name is very common, I get A LOT of 'reset password request' emails. ANNOYING. Hmmm that's interesting Kimberly. I haven't heard of the password reset emails, but I have heard a bit about it being spammy. Luckily you can block those accounts from asking you questions, but it will be interesting to see how Formspring evolves in the coming year.